Although naturally derived from the chrysanthemum flower and generally safe for use on cats, pyrethrin can produce a toxic reaction in some animals. Pyrethroids, synthetically formulated versions of pyrethrin, include permethrin, phenothrin, allethrin, fenvalerate and fluvalinate, among others. Used primarily to control fleas and ticks, products containing any of these ingredients may be labelled as safe for use on cats, provided you closely follow instructions for use. Not all flea products containing pyrethrin or pyrethroids are appropriate for use on cats. Products containing a higher concentration of active ingredient, in the range of 0.5 to 0.97 percent and intended for use only on dogs, are the most common cause of pyrethrin poisoning in cats. Products with pyrethrin for cats usually only contain a concentration of between 0.05 and 0.15 percent of the active ingredient. Cats have a higher sensitivity to chemicals than dogs, and typically ingest more of the product due to their fastidious grooming habits. A cat's metabolic system fails to rid his system of pyrethrin and other poisons less effectively than a dog's system, making him more susceptible to poisoning. Very young, very old or sick cats run a higher risk of pyrethrin poisoning than a healthy adult cat. 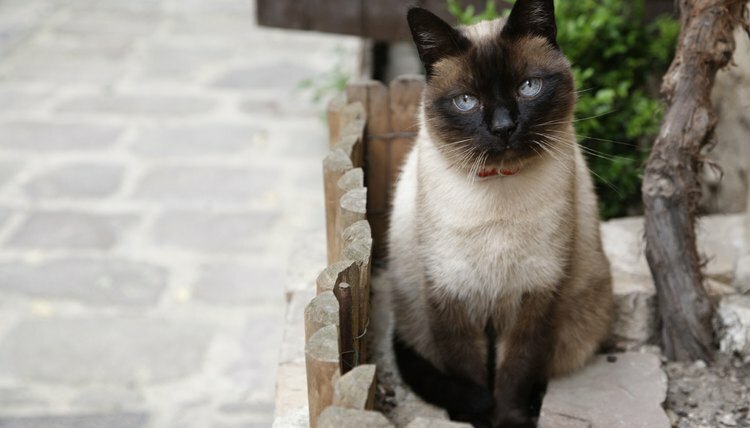 Most cases of pyrethrin poisoning in cats are mild in nature and symptoms ease or disappear completely within 24 to 72 hours. Most commonly, a cat experiencing the adverse effects of pyrethrin will salivate excessively. Other mild reactions may include vomiting, diarrhea or some degree of lethargy. Occasionally, a cat will suffer more serious adverse reactions to pyrethrin products. Symptoms may include seizures or muscle tremors, lack of coordination, agitation, breathing difficulties and hypersensitivity. Rarely, death may occur. In the case of a severe reaction, seek immediate veterinary care. The most important aspect of treatment for a cat suffering pyrethrin toxicity is prompt removal of the product from the cat's coat. Generally, a warm bath using a gentle dishwashing liquid successfully removes the greasy flea products from your cat's coat. Dry him with a warm towel. In more serious cases, your cat may require advanced medical treatment including administration of fluids or medications prescribed by your veterinarian to help ease symptoms and detoxify your cat's system. Use of products only intended for use on cats and taking care not to oversaturate your cat's coat constitute the best methods for preventing pyrethrin poisoning. Use the products only as instructed on the label and use sparingly, especially on sensitive cats. If using a flea dip, apply the product with a washcloth or sponge rather than saturate the cat with the product. Avoid applying the product on the cat's face and take care the product does not enter the cat's nose or mouth.